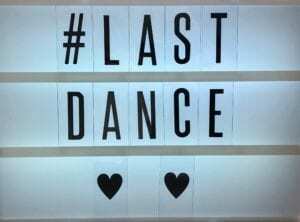 When meeting with couples to plan their wedding I always ask them how they want to happen at the end of the wedding disco, and they nearly always say that they hadn’t given it any thought, for me how we finish the night is almost as important as how we start the wedding. 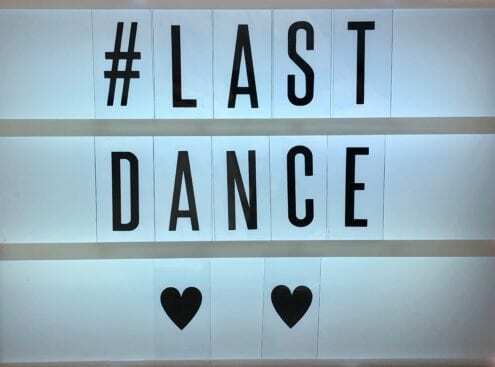 This is the final memory that you and your guests are going to have of your wedding day, do you want it just fizzle out or end with a memory that you will last for years. If done correctly this is a truly amazing photo opportunity. Obviously, the choice of song that your wedding DJ plays is also very important as this will determine the atmosphere created in the room. A Circle or sometimes called the “Circle Of Love” and there are two options here, firstly all your wedding guests form a circle on the dancefloor, you and your partner pick a point in the circle, one of you goes clockwise, the other goes in the opposite direction, you then say goodbye to all of your guests. While this is happening we play some great fun music, and once you have both said goodbye to all your wedding guests you all dance together to your last song. The alternative is with all your guests in the circle, you and your partner dance in the middle to your last song. 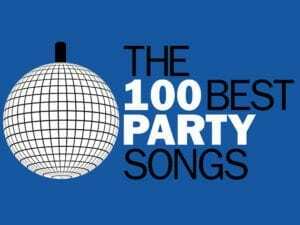 The Big Anthem some people don’t want either of the above and want their wedding disco to end with everybody joining them on the dancefloor dancing and singing together to your favourite singalong anthem. Slow Dance a romantic way to end your wedding, with everyone a smooch on the floor, and bring back the first dance song is a great way to close the wedding. If you would like to chat about how we can create an amazing end to your wedding reception, either text or call me on 07736-880 790, or email me at ian@ian-stewart.co.uk or fill in the short contact form here. 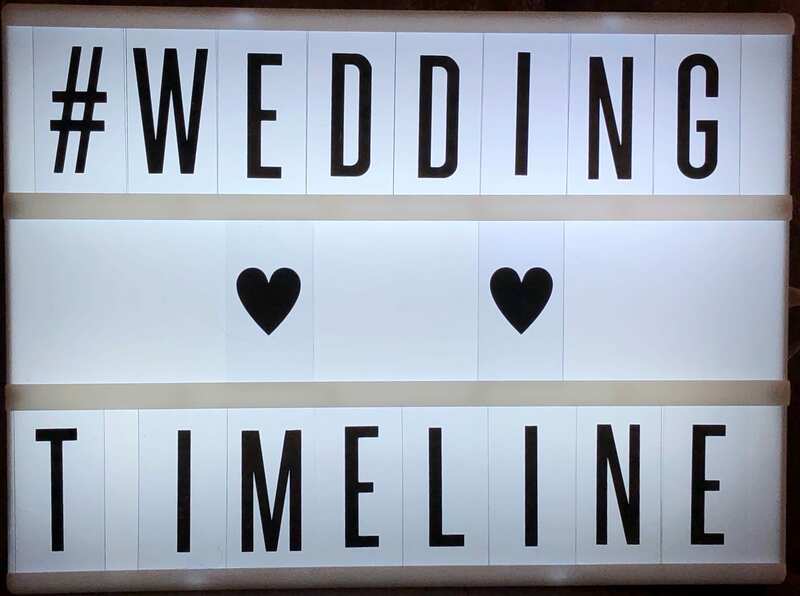 As you can see there are some subtle differences between the two wedding timelines, but as I said previously it gives you an idea of what needs to be considered when planning your wedding day. So England won a knockout game and a penalty shoot-out in The World Cup, how amazing is that. The whole country is understandably ecstatic, everybody wants to watch the next game versus Sweden. Then you think to yourself hang on, the game is on Saturday at 3 pm, right in the middle of my wedding. 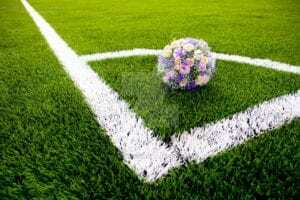 So hopefully this small blog will help you with advice about world cup football & your wedding day. You might be getting messages asking if there will be a TV at the venue as they want to watch England v Sweden in The World Cup. It is the biggest day of you and your partners lives, it’s your wedding day, it’s a once in a lifetime day. The world cup happens every 4 years so the guests can miss one game. I don’t want the football at my wedding. We have spent good money on food etc. You understand that some people will find a TV somewhere, and understand that they will disappear for a while and find the TV to watch the game. As the game is at 3 PM, right in the middle of our wedding day we are going to embrace the football, put a screen into the room and all watch the game together. People still found a TV to watch the game and disappeared for the two hours the game was on. At one wedding The Bride got very upset and even told the guests that she wasn’t happy and asked the venue to turn the game off. Some people left the wedding never to return. This worked perfectly fine, those that wanted to watch the game did, those that didn’t stay within the wedding party, both people were happy although the party was split for a while. everybody returned to the wedding and the party continued. The couple put a screen into the room where the wedding was being held and everybody watched the game together, it created a great atmosphere and once the wedding was over the party continued. Only you can make the decision about how you deal with The World Cup at your wedding, but put yourself in the shoes of your guests. As A wedding DJ couples often tell me that they want all their guests smiling, and having fun. My advice is either solutions 2 or 3, If I was the Master Of Ceremonies / DJ at your wedding I could make number 3 really fun. Because happy guests mean a happy wedding, which means a happy Bride & Groom. If you would like some advice or help please call or text me on 07736-880 790 or email at ian@ian-stewart.co.uk or complete the contact form here. 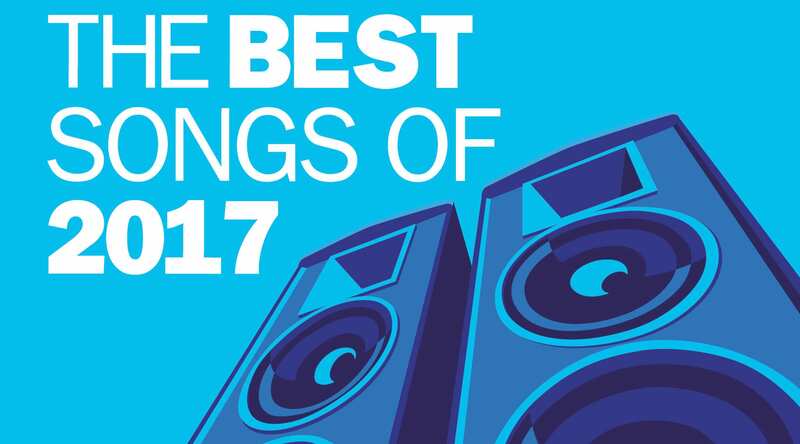 So I have counted the dancers, and checked the songs, and can reveal what was the Top Dancefloor Songs 2017 at the functions that I entertained at in 2017. Last Wednesday night it was the regional finals of The Wedding Industry Awards at The fantastic Granary Barns Nr Newmarket in Suffolk. The night was truly an amazing night with the top wedding suppliers in the whole of Hertfordshire, Essex, Suffolk and Norfolk. 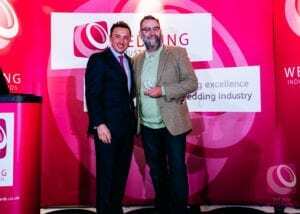 The night is about recognising those suppliers that excel with their bride & grooms. I was obviously in The final for wedding DJ, there were 7 truly talented DJ’s in the final. When the winner was called out I honestly could not believe it when the host said “The Winner Of Wedding DJ Of The Year For The East Of England Is Ian Stewart” I felt so humbled to have won this prestigious award, I can’t thank the all the couples enough who voted for me, you are all amazing! I am now in The National Final, which will be held on 17th January 2018 at The Prestigious Cafe de Paris in London where I will be there with 9 other of the UK’s most talented DJ so the competition will be tough. I will, of course, keep you all informed how I get on in the national final of wedding DJ of the year for the whole of the UK. 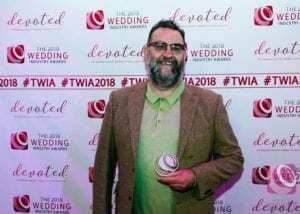 If you would like to find out why the couples voted for me to win Wedding DJ of the year for The East Of England, then call or text me on 07736-880 790 email me at ian@ian-stewart.co.uk or complete the contact form on this page. I am so honoured to have made the regional final of Wedding DJ Of The Year and I would like to thank all the lovely couples who voted for me, especially the couple who nominated me for this prestigious award. I am really excited about this, as when you think about all the wedding DJ’s in Hertfordshire, Essex, Suffolk and Norfolk, to be in the top 7 wedding DJ’s for the region is an amazing achievement and honour. I am up against some amazing DJ’s so I know that it’s going to be tough, but as with all things, I am very positive. Best of luck to the other 6 wedding DJ’s may the best man or DJ win. A couple whose wedding I DJ’d at nominated me, then other couples were asked to vote for me, of all the DJ’s that were nominated, the best 7 reach the final for The Wedding DJ Of The Year, which will be held at The Granary Barns Nr Newmarket. On the night the winners of each category will be announced, with those winners being entered in the national finals. These will be held on 17th January at The Prestigious Cafe De Paris in London. 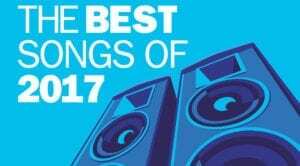 If you are getting married and would like to know why couples voted me in the Top 7 wedding DJ’s in the East Of England, then phone or text me on 07736-880 790, email me at ian@ian-stewart.co.uk or complete the form here. Sometimes I get asked to DJ for other DJ companies, and Saturday was one of those times. I Was The Birthday Party DJ for Richards 60th. Mighty Fine Entertainments are One London’s top DJ agencies had a special client whose CEO had a 60th birthday party at a new venue for me. The Westminster Boating Base, which is an amazing location, right on the river Thames, with views of Battersea Power Station. I was booked to DJ alongside one of the UK’s top saxophone players, Mr Carl Stanley, it a pleasure to DJ with a musician that you are on the same wavelength with. We complemented each other perfectly with him playing along to the music that I was playing. It was amazing to meet a musician that I had played with a musical hero of mine Mr Roy Ayers, someone that I have seen live many times. The music consisted of Old Skool dance classics, 80’s Soul Weekender Anthems, Motown, some current songs, and of course some classic 80’s party tunes. 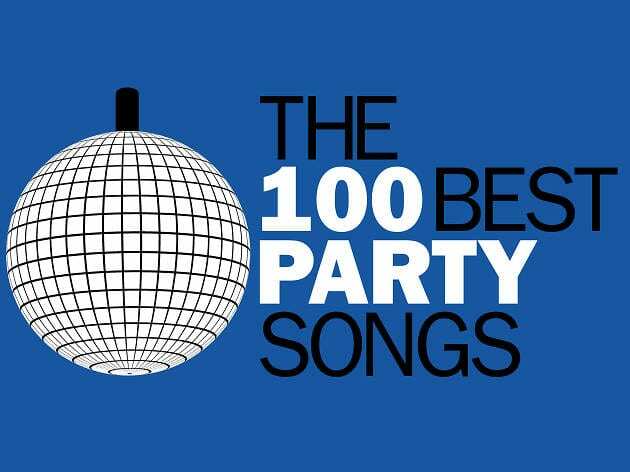 If you are having a birthday party and want these or any of the other songs in my extensive music library, then give me a call or text on 07736-880 790, email me at ian@ian-stewart.co.uk or complete the short contact form here. You want a wedding supplier who is passionate about their business, and more importantly enthusiastic about your wedding day. So if they are sat at a table behind their stands, chatting with their colleagues, or on their smartphones, seeing what is happening on social media, or eating their lunch, so how enthusiastic will they truly be about your wedding day. 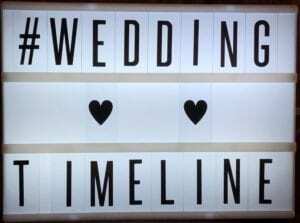 Find Suppliers who are stood in front of their stands, engaging with couples. Allow your self enough time to walk around the whole fair, just like a visit to the supermarket, plan your route. Look at all the stands before talking to anyone, prioritise the services that you need, and find the suppliers who are offering those services. Remember you don’t have to book everything in one visit. Suppliers with a genuine interest in your wedding will be enthusiastic about finding out about you and your dreams for your wedding day rather than just chatting about their services. If they talk about what they do rather than what you want for your day. Some Suppliers do get booked up early but don’t feel pressured into making a decision that you may later regret, all reputable suppliers will hold a date for you, and maybe arrange a more in-depth meeting with them. Don’t fall for the “you can only get this discount if you book today” trust me that discount will still be available in 7 days. A Wedding Fair is a great opportunity to talk to suppliers face to face, find out if you like them, 1st impressions do count. Don’t be afraid to haggle, especially if you are interested in a few things they offer. Get any offers in writing, as the supplier will speak to many couples and may forget what they discussed with you. Important Notes! Make sure to find out if there are any hidden costs that may come up and bite you later on. Delivery, set-up and collection costs are the main ones to keep an eye out for! 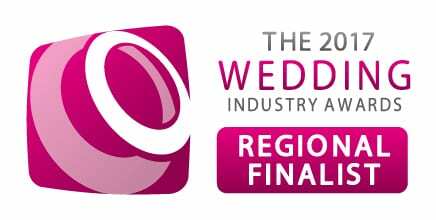 After a year of hard work, and entertaining at some amazing weddings across the UK I am honoured to have made the final of the BEST WEDDING DJ for the Eastern Region in The Wedding Industry Awards. The final is to be held at the amazing The Granary Estates, Woodditton, Suffolk, on 16th November 2016. The finalists are chosen from votes from couples that I have worked with over the last year, so to make the final shows that hard work and dedication that I put into make your wedding day perfect.